The 2018 Partypoker Live Millions Grand Final is taking place right now at Casino Barcelona in Spain. 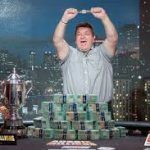 The festival, which runs thru April 15, will culminate in a €10,000 ($12,386) buy-in, €10 million ($12.38 million) Guaranteed Main Event, but already two major tournaments have wrapped up. Oh Baby, What a Score! In one of two €25,500 ($31,584) Super High Rollers, 90 entrants took to the felt. That helped surpass the €2 ($2.5) million guaranteed by creating a €2,182,500 ($2,675,059) prize pool. 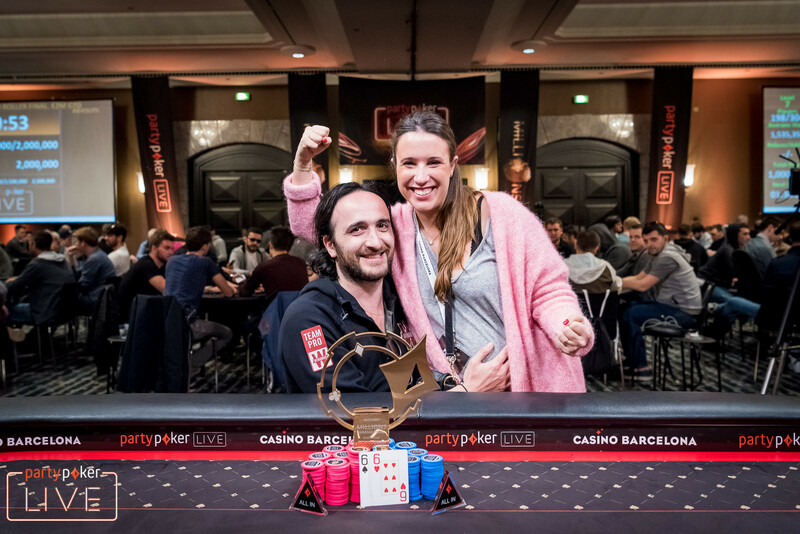 The title came down to Belgian Triple Crown winner Davidi Kitai — a three-time World Series of Poker bracelet winner — and Spain’s Juan Pardo Dominguez. The 25-year-old Dominguez, who was making back-to-back Super High Roller final tables, began heads-up play with a 7/1 chip lead, but two quick double ups saw Kitai pull out in front. From there, he set about whittling away at Dominguez’s stack before the duo got it in. It happened in Level 29 (700,000/1,400,000) when Dominguez moved all in for 19.8 million with the Q♠J♠ and Kitai called with the 6♠6♥. The board ran out 4♥A♥10♠7♥4♠ and Dominguez was eliminated. Kitai, who got married just last summer, had major new-dad-to-be motivation to take home the big moolah, as his pregnant wife was on the rail throughout the final table. “Every time I was all in, I kept thinking about the baby and rubbed the belly,” Kitai told partypoker officials. The $857,980 win was the second largest of Kitai’s career, behind only his EPT8 Berlin win, which was good for $930,816. It brought his lifetime earnings up over $9 million and extended his lead on Belgium’s all-time money list. Also cashing the tournament was 2017 GPI Player of the Year Adrian Mateos, who notched his second fourth-place finish of the series, this one good for €215,000 ($263,522). It’s been a good six months for Germany’s Andreas Eiler. Back in November, he finished runner-up to Dominik Nitsche in the 2017 World Series of Poker Europe €111,111 High Roller for One Drop for €2,155,418 ($2,511,762). This past weekend, he won an additional €700,000 ($857,980), the second-largest score of his career. 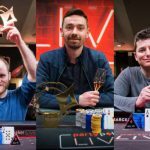 The other 2018 partypoker LIVE MILLIONS Grand Final €25,500 Super High Roller attracted 88 entries and once again surpassed the €2 million GTD by creating a €2,134,000 ($2,615,613) prize pool. Among those to compete were poker power couple Alex Foxen and Kristen Bicknell, who both made the final table. The latter exited in eighth place when his pocket jacks were cracked by the pocket tens of Rainer Kempe. Unfortunately, Bicknell’s boyfriend followed her out the door in seventh place. It happened when Foxen shoved the button for his last seven big blinds, holding the Q♦8♠, and Mateos called from the big blind with the K♠6♠. Foxen needed to improve, which proved easier said than done, as the board came a dry 5♥3♣2♠9♠5♦. Together the couple won $183,853. 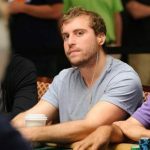 After Poker Hall of Famer Erik Seidel fell in third place, the result of his ace-ten failing to hold against Eiler’s nine-seven, the title came down to Eiler and Kempe with the former holding a big chip lead. Within 30 minutes, things came to a head in Level 28 (500,000/1,000,000) when Eiler raised to 2.3 million with the A♣9♥ and then called when Kempe shipped with the A♥6♣ for 20.9 million. The board ran out 3♠10♦3♣4♣5♥ and that was all she wrote for Kempe, who took second for €450,000 ($551,558). 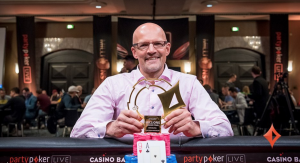 It was Eiler’s first win since May 2012 when took down a €25,000 High Roller at King’s Casino Rozvadov for $265,545. wow what luck, and congratulations, let’s hope some day one of us can win a tournament of that category ..
its always bad to put all in without a pair, even if its small pair , going all in with QJ is too dangerous. I have never seen an event having a so big covering of streaming (in another hand I am a newbie and there is not time and way for I had seen many poker stuff, but…). All scenes was very beautiful! Partypoker makes poker world to seem like magic! Yes, true, Partypoker is going quite aggressive in the live poker arena and this is very encouraging for the poker world. 90 entrants for the $30K Super High Roller is pretty good. The Final Table with players like Steve O’Dwyer, Justin Bonomo, Riess was brutal. Congrats to Davidi Kitai. He is one of my favourite MTT players and I think he is one of the most underrated, yet super solid, live MTT players over the last decade. but he risked it, and the other one wants poker a little too!